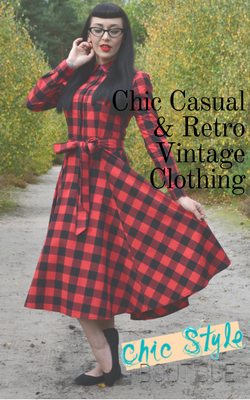 Little Miss Doo Wop | Pin up, rockabilly and vintage fashion and lifestyle blog: Pinup Girl Clothing Wishlist! So my soon to be Husband and I are going on our Honeymoon the day after our wedding in July and I could not be more excited. I am excited as not only are we going to be spending 10 nights in Hawaii, (where I will be sunbathing while an attractive, dark haired man called Keaweaheulu brings me pineapples and coconuts filled with alcohol), but we will also be stopping off in California on the way there. This means, you've guessed it...PUG! By a complete stroke of luck, our hotel is just a 10 minute drive from the Pinup Girl Boutique, located in Burbank, California. 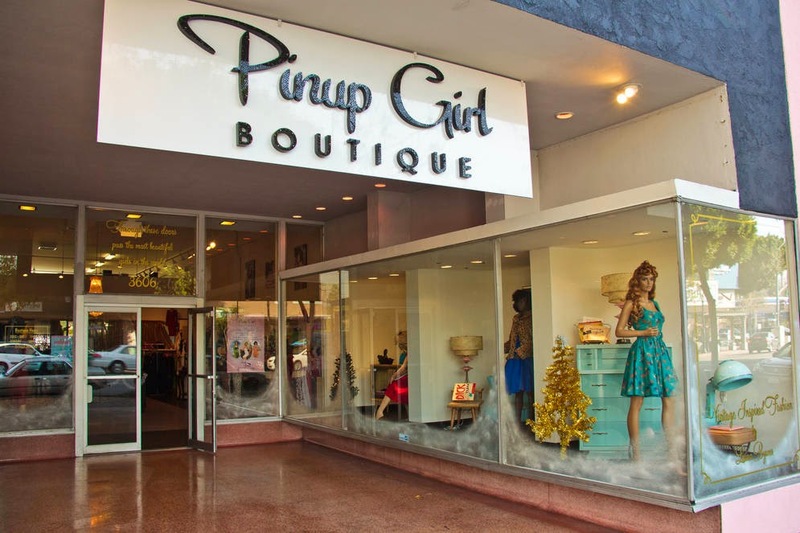 The Pinup Girl Clothing Boutique in Burbank, California. So I have told (not asked, TOLD!) my future Husband that we just must go! I have wanted to buy so many items from Pinup Girl Clothing for such a long time, yet without knowing how their clothes are sized, I have been anxious about doing this, for fear of ordering a dress, paying for postage to the UK (and potential custom charges), for it to arrive and not fit. This would be pretty devastating! So I have decided to go the boutique, in order to actually try on their clothes, in order to determine my size. So in preparation for my pilgrimage to the land of PUG, I have devised a Wishlist. I hope to bring some items on my list back to Blighty and review them for anyone else who, like me, would like to join the PUG club, but just doesn't quite have the confidence to buy online! So please join me in the first part of my PUG journey...the wishlist! I love this t shirt. I have been after a Baseball style top for a while and this one is just perfect in terms of colour and style. I absolutely love red and I think this top would look great with a pair of Freddies jeans or a black wiggle skirt. The Deadly Dames Capri Pants are everything! I mean, just look at them! I have a pair of Hellbunny Capris in black and I love them so much, so would just love a PUG pair in red. The Leopard Bengaline capris are also to die for, so they may just magically find their way into my shopping bag too. 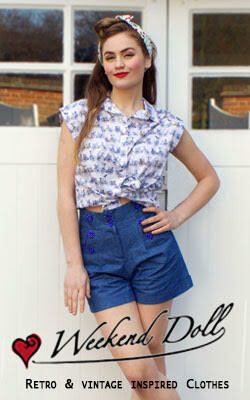 The Doris top is a great pinup separate. It can be worn with wiggles, circles, capris or shorts! I would like one in black (obvs) but a red one would also not go amiss! I don't think that the Vogue skirt needs any explanation...just look at it! Although I am not sure that my waistline will look like Doris' while wearing it thought! That's a future blog when I have invested in a corset! Now, as previously stated, I am a wiggle dress kinda girl. I feel like this is an area that is often overlooked when it comes to reviews of Pinup Girl Clothing. I see so much online about circle skirts and dresses, yet not a great deal on more fitted styles, so hopefully I can share my findings about fit if I manage to pick one up! I could not have a holiday in Hawaii without wearing a tiki dress! This dress and bolero twin set is just to die for. The colour looks quite red on the website, so I hope that it is not too on the orange side in real life. I love nautical themed clothing, so I am certainly going to try and get hold of this dress. It looks perfect for a fun night out, but could also be teamed with a bolero or a cardigan for a more casual look. This dress is gorgeous and again, perfect for a holiday in the tropics. The Tiger print version of this dress is also amazing. So 10 nights in Hawaii is going to require swimwear and I have a passion for all things nautical when it comes to this department! So the Bettie Hello Sailor swimsuit looks like a winner to me! So that is my little wishlist. To be honest, if I only get 1 of the items on this list, I will be happy. At least I can say that I brought it from the Boutique! I will also know going forward what size to buy when I get back home to the UK. If I do manage to buy anything, I will be sure to report back on sizing and fit for any PUG virgins in the UK like me! On a separate note, if anyone would like me to bring anything back for them from the boutique, please do get in touch, as I may be able to bring back 1 or 2 items and save you a pretty penny on shipping and customs! N.B Prices listed are based on the exchange rate at the time of writing and have been rounded up to the nearest whole GBP.